2.1 What Are Sulbutiamine Benefits? 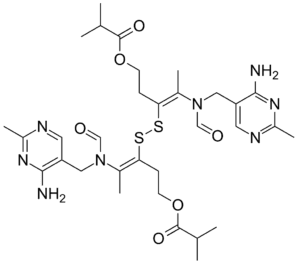 3.1 How Does Sulbutiamine Work? 4.1 How To Take Sulbutiamine? 6.1 How To Take Sulbutiamine? Summary: Sulbutiamine is a nootropic that boosts energy levels and reduces fatigue. It’s an ideal choice on days when you’re feeling tired, slow, or hungover. Furthermore, Sulbutiamine elevates mood and has a substantial impact on memory. Sulbutiamine (brand name: Arcalion) is a synthetic derivative of thiamine (vitamin B1). In France, it is used to treat symptoms of weakness or fatigue. It also sells as a dietary supplement. Several extensive studies have found that sulbutiamine significantly increases energy in people who are feeling fatigued. Sulbutiamine benefits Increase energy & stamina. Enerion was used in the treatment of 40 patients with psychovegetative syndrome and asthenia. Before treatment, the patients have pronounced asthenia appearances, anxiety disorders, relevant autonomic disorders, mild depression and decrease of working capacity, attention concentration and memory. The treatment conducted as monotherapy during 28 days with enerion dosage 400 mg/day. After treatment, expression of autonomic and asthenic disorders was reduced significantly, along with improvement of psychometric and neurophysiological indices. High efficacy of the medication was in 75% of the patients and moderate one–in 25%. It has a growing number of fans in the nootropic community, many of whom report improved mood and heightened mental endurance. Sulbutiamine is a molecule which is two Thiamine (B1) molecules linking together, similar to how Pyritinol is two Pyridoxine (B6) molecules link together. Sulbutiamine is a fat-soluble molecule that crosses the blood-brain barrier more readily than thiamine. Once in your brain, it increases levels of thiamine pyrophosphate (TPP). Thiamine pyrophosphate (TPP) is directly involving in the citric acid cycle in the brain. How to take: Sulbutiamine supplement recommendation dose is 400mg. However, caution is necessary in regards to cycling sulbutiamine and not supplementing on daily basis. At standard doses (200-1000 mg), side effects could include a headache, nausea, and trouble sleeping. Experiment is key to finding the dosage and cycle that’s just right for you and your body composition. Its a great choice to consider on days where you need extra mental functionality. Sulbutiamine is becoming more and more popular in the biohacking community. If you’re curious, give it a try and see how you feel. …I only heard about nootropics for the first time around 9 months ago. Used to take Adderall for many years, but quit over 5 years ago because it was causing daily headaches and I suspected it was causing my chronic insomnia. I have legit ADD, as well as what I would call brain fog, low level depression, lack of motivation. I’ve taken sulbutiamine a few times, and I have really good results with it. I only take it occasionally, when I have a big project I need to get done (because I don’t want it to stop working, like I’ve read that it will if you take it often). I took it today because I had a lot of organization tasks I needed to do, and since I hate these kinds of tasks, I often lack motivation to start or complete them. When I take my capsule, I can actually feel it start to kick in around 20-30 minutes after taking it. It reminds me a lot of how Adderall worked/felt but without that unexplainable “buzzy” feeling. I felt motivated and energized, and really got into my work. Just thought I’d share for any other noobs out there who haven’t tried it yet.